I love Skymasters. I have owned two: a 1965 337 previously, and a 1973 P337. But my love affair with Skymasters goes back much further than the six years I have actually owned the airplane. The first time I saw a Skymaster was in 1967. 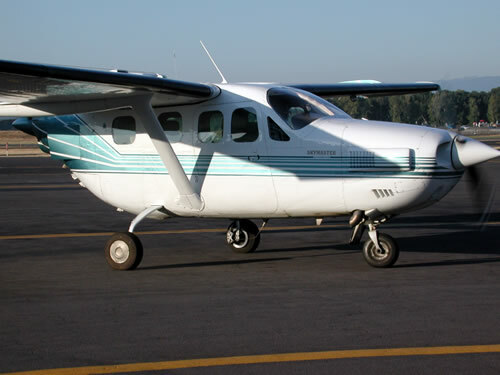 I was 12 years old, and Cessna sales flew a demonstrator to Torrance Airport, where I was already an "airport kid", earning money washing airplanes and dreaming of getting my pilot's license. When I first saw that Skymaster, it seemed too much to hope that I might someday fly one, let alone own one as I do now. In my twenties and thirties, I read everything that I could get my hands on about Skymasters, and continued to dream, even when I finally managed to buy my first airplane (a Grumman Tiger). I subscribed to the original Skymaster Newsletter published by O.R. Whittaker. I saved every magazine article (until I threw them out by accident about 8 years ago, sigh...). More recently, I have kept track of Skymaster related activity on the web as best I can. There was a flashy but content-free site that appeared first, followed by other sites (Bill Crew's among them) that began to offer useful stuff. But I really didn't find a site that I kept coming back to until I found Peter Olding's site a while back. Peter's site had a message board, and he also established an email list (was skymaster@yahoogroups.com no longer available). Peter's site was (and is) content rich, and his message board, along with the email list, helped establish an electronic community of Skymaster owners, pilots, and folks just interested in the aircraft. As I used Peter's site, I often dreamt about features and services that I would offer if I had a site, but probably would never have acted on those dreams, but for a couple of temporary interruptions to Peter's site, the most recent of which caused those of us who were regular visitors to begin to worry that it was not coming back. We learned how much we valued what we had when it was gone. Peter's site is back now (without a message board), but while it was down, I decided to get off my duff and try, with my wife Liza, to create a site that had content more oriented to Skymaster pilots and owners, and one that had additional features that I think are important. The result is the site you are looking at right now. A moderated message board that allows attachments (pictures, etc.) to be included with messages, supports threads effectively, and many more features. See the welcome message on the board for more..
Skymaster aircraft values and registrations counts. Links to Skymaster web sites, along with a short description of each. I hate web sites that talk about what they are going to do "real soon now", because frequently they never get there, so I won't do that here. But several other regulars (see Acknowledgments) have offered enough ideas to keep me busy, along with the help of others I hope, for a good while. Please help us with this site. Report any problems you find - misspellings, broken links, features that are hard to use, etc. to webmaster@337skymaster.com. We'll act on your reports as soon as we can. Tell us also about features that you would like to see - things that would be truly useful to you. We don't promise to use everything submitted, we wil be acting to a certain extent as editors of the site, in order to make it the best resource possible for you. This is your site. Please help us make it a great one. But before you send anything to us, please make sure it is yours, or that you can identify who owns it so we can obtain permission for its use. We want to make every effort not to use material unless we have permission to do so. Initially, Kevin and Liza funded this site primarily from their own pockets. Donations were also received (see the Acknowlegements page) and they were very helpful. There is no advertising, no membership fees. We may someday present paid advertising to help defray the cost of the site, or sell merchandise, or whatever, but making money is not the reason we built the site. Initially Kevin and now SOAPA and its members have done this because we love the airplanes, love talking about them, and enjoy collecting information about them. Most of all, we enjoy socializing and learning from other Skymaster owners and pilots, and this is a great way for us to do that. The messages submitted to this site are public domain. The material submitted to this site (content) is public domain unless the submitter informs me that he or she wishes to maintain copyright. The graphic design of the site, and the scripts and other software developed by me to support the site are my property. I make my living as a software engineer, and I plan to experiment with some software on this site that I won't want to give away. But if I disappear from view for two months, cannot be contacted, and the site is down, then all of the content, scripts and software on this site may be used by others to put up a site of their own, and I will lose any rights I have to any software other can access. The only exception to the above is the base message board software, which is perpetually licensed for this site, and can be used forever for the URL 337skymaster.com, but otherwise remains the property of Jelsoft. Glad all that is out of the way. We hope you enjoy the site! Please let us know what we can do to improve it, and also what you like about it. There is a fair amount of work embodied here, and it will, we hope, be nice to know if you find it valuable.